The secret to the Solasfera's brillaince lies in its facet structure and light performance. Unlike traditional designs, the Solasfera is cut with 91 facets and 10 Hearts & Arrows, maximizing its light return, fire and scintillation. 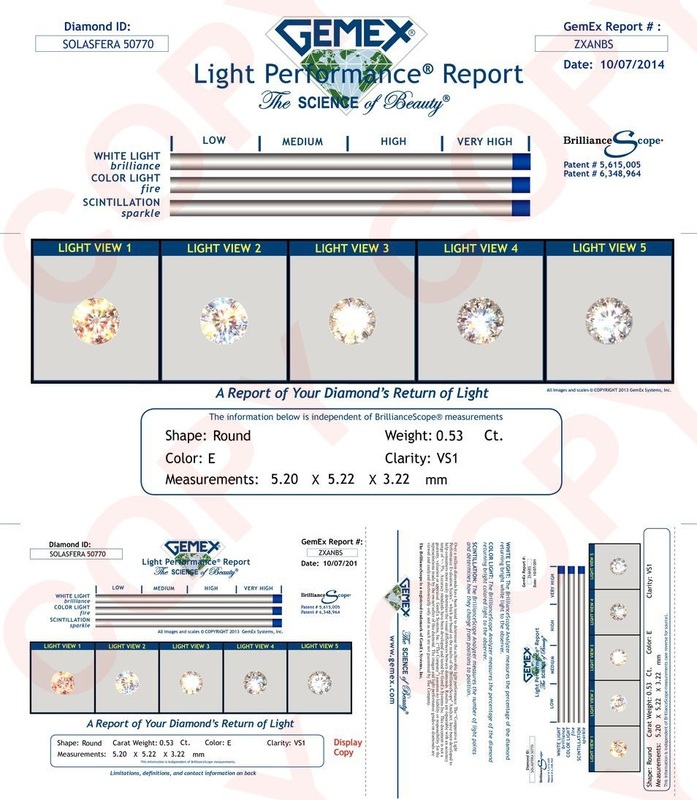 The superior life and luster of a Solasfera diamond is immediately visible to the naked eye under all types of lighting. There are several scientific methods and tests that can help you understand why the Solasfera's light performance is above all. There is no other diamond like a Solasfera. During a side-by-side test, Solasfera has proven to outperform all other modifed rounds across every light performance tests available. Most diamond cutters, driven by profit objectives, cut a diamond to maximize its weight at the expense of ideal proportions, damaging the diamond’s light performance and beauty. 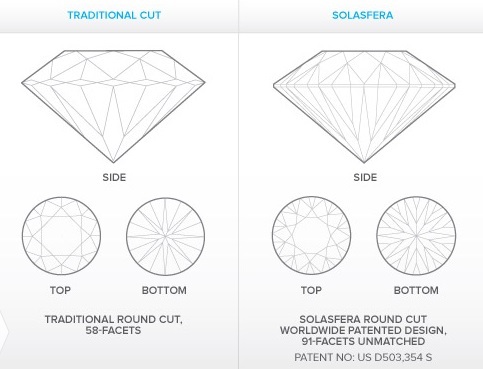 Unlike others in the industry, Solasfera diamonds are always cut to maximize beauty, not size. Generically cut diamonds tend to have light leakages. Solasferas are capable of grabbing hold of the light surrounding them and returning it to the eyes of the beholder. It manages to disperse light thoughout, allowing a wide dispersion of rainbow flashes. Under the Ideal Scope, it shows that the Solasfera acheives a full light return (full red). This gives the diamond a magnificent brightness, where light paths that are going into the diamond are being reflected back out towards your eyes. Hence, the Solasfera can appear ''whiter'' compared to another diamond with the same color grade due to its extrodinary brightness. The Solasfera has exacting symmetry where each diamond is crafted with unparalleled precision. This can be seen under the Hearts & Arrows scope to analyze its 10 symmetrical Hearts & Arrows. Being over the top in it's light performance, each and every Solasfera comes with a Gemex Light Performance Report. The Gemex is an independent lab that measures the Brilliance, Fire and Sparkle of a diamond. The Solasfera manages to acheive the highest possible grade possible. No other cut has been able to do so. 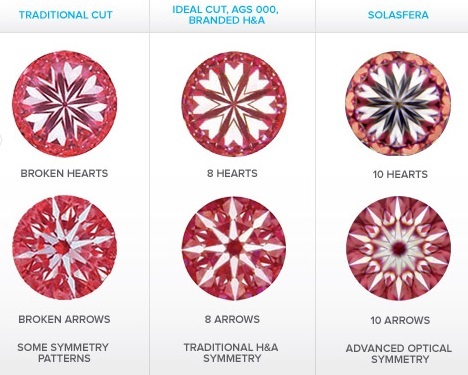 Scientifically proven, Solasferas has the ability to outshine all other round cuts in the market. It is available from 0.3ct onwards and we have assorted sizes for Solasfera melees that can be set on wedding bands. Each Solasfera diamond comes with a GIA or AGS report, Gemex report and scope images analysis (Actual, Ideal, ASET and Hearts & Arrows Scopes). Visit us to experience the Solasfera brilliance yourself and set light free! Here's a video of us unboxing a Solasfera diamond ring! The Solasfera is a 91 faceted diamond with 10 Hearts & Arrows. It has higher facets than the traditional 57 faceted rounds, giving it an extreme amount of scintillation where you'll notice a crazy amount of sparkles throughout the diamond. Watch towards the end of the video, where we brought the diamond outdoors under sunlight! 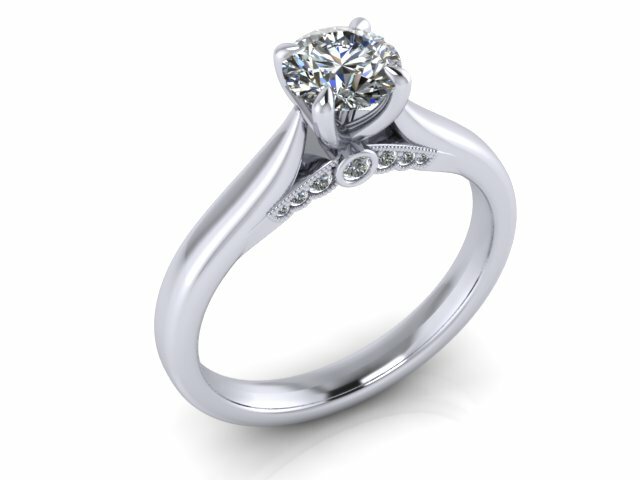 The ring design is a custom setting, with melee diamonds on the under bridge. Each melee diamond is sorrounded by milgrains to highlight and bring out the detailings of the ring. 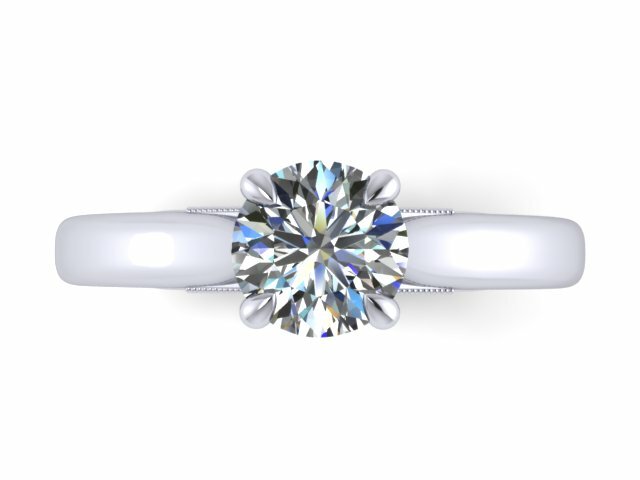 The main diamond is mounted on a 4 prongs setting, designed and oriented to allow an unblocked view of the main stone. 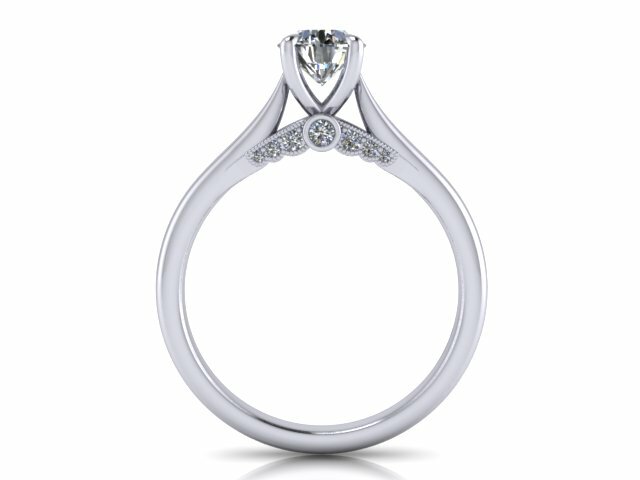 This gives the ring a clean and sleek look and give the appearance that the main diamond is higher. Below is the 3d render of the ring design, which comes with all of our ring customization works. 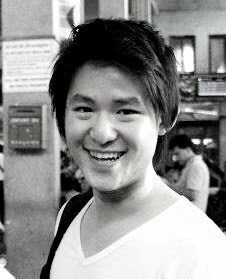 Albert Einstein once said that the definition of insanity was “doing the same thing over and over again and expecting different results”. This is the exact theory that has fueled one of the most well-known engagement ring designers to believe that one should never settle for average. 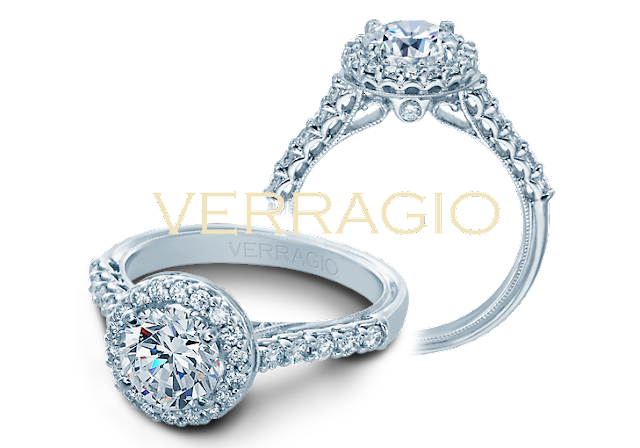 Verragio is one of the most popular brands of engagement ring designs in the world. With its wide array collection, ranging from contemporary to vintage design, it is of no doubt, a brand that exhibits timeless beauty and elegance. What makes their line very unique is the stunning lacy designs called filigree. In this blog, I will share with you the 5 popular collections of Verragio. This collection accentuates on the 4 customizable wraps on the band, giving a distinctive look to the ring. 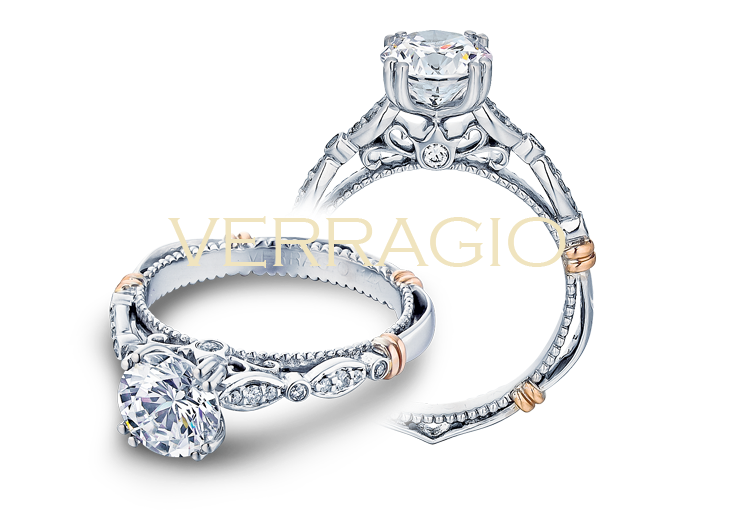 To add on, it’s one of the budget-friendly collections that Verragio have. It is Verragio’s tribute to the vintage era focusing on the extremely detailed side profile of the ring. It even allows you to customize the most commonly unnoticed bottom part of the band. However, one thing to note is, making this wavy design on the bottom band will make it more costly to resize as we would require sending it back to Verragio’s workshop. But then again, Verragio is now introducing a more revolutionary way of resizing your ring called “Fit-right Solution”. This will allow you to resize your ring without having the need to cut, alter, reshape and possibly damage your engagement ring on the process. 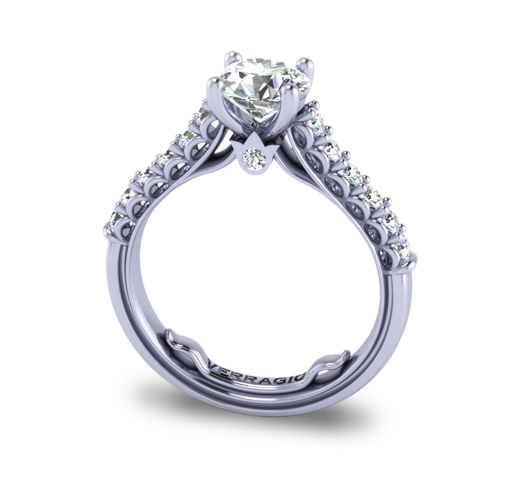 Fit-Right by Verragio is a simple, yet innovative way to solve your ring sizing needs. This new sizing method will now allow you to have your Verragio ring sized down anywhere from 1/2 to 1 1/2 sizes. I would say, the initial time you look at this, it would be kind of similar to the Venetian collection but actually this line highlights the multi-colored gold band (white & rose) setting. 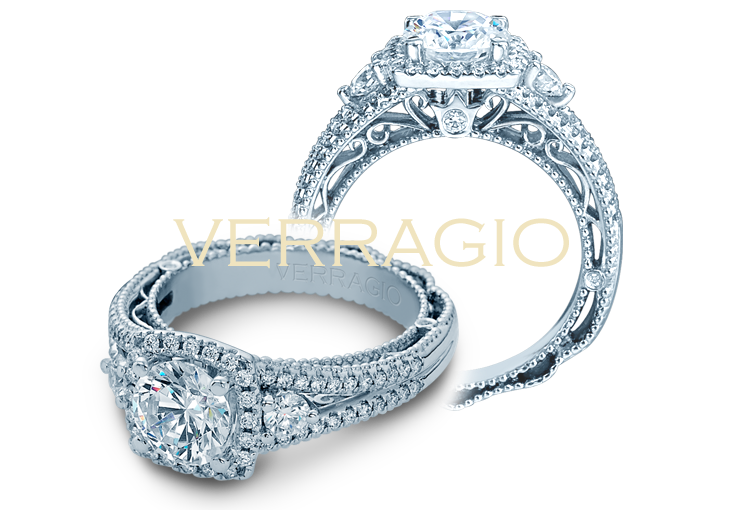 If you want a more dramatic look, I feel like this is definitely the design youwant to shortlist as the intricate detailing of its band sets it apart from the rest of Verragio designs. The Insignia collection features fluidity, style and design. It has heavy influence of the signature scrolling design and crown of the Verragio logo. What I personally love about this collection is that, despite its extravagant internal scrolling design, it is made for comfort. Overall, it gives a majestic feel on the ring while keeping the ladies wearing it at ease. 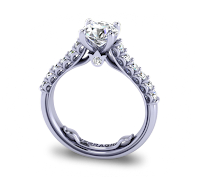 This is the newest line of Verragio which is also one of the most cost effective. It is custom made to showcase French bidding on the interior of each ring that gives it an elegant vintage feel. What’s more interesting is that, all Verragio settings are individually hand crafted to achieve superior quality in both appearance and feel. Question: Where can I try and buy this incredible setting? Verragio’s authorized retailers are carefully selected to carry the Verragio line and represent the quality of the brand name. Each authorized Verragio retailer is dedicated to promoting the Verragio message of quality and luxury. 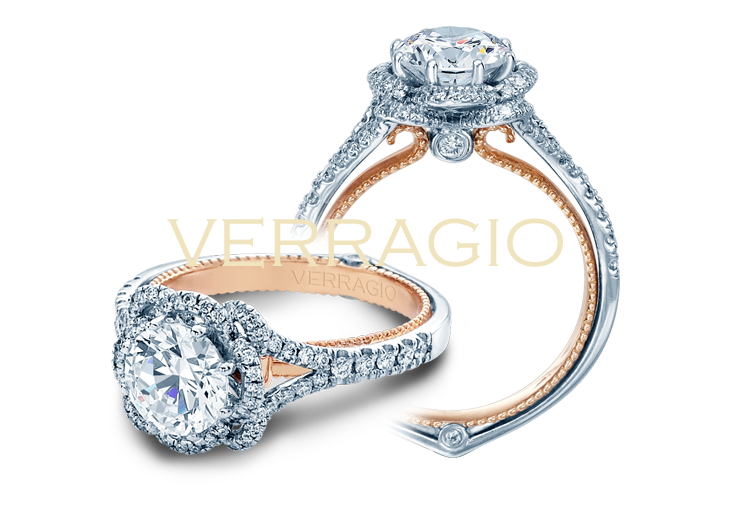 And we’re proud to be the Verragio representative in Asia. 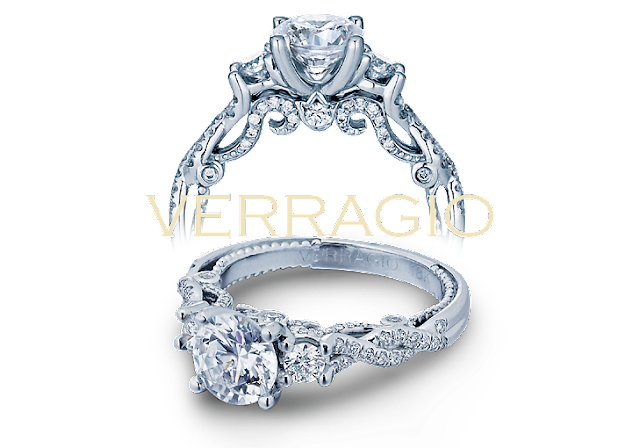 Hope this blog’s helpful to you guys, for more details you can visit Verragio’s website, I’ll provide the link below. Or better yet, if you wanna try out some of their settings, just book up an appointment with us now. See yah! Our new Solasfera shipment has arrived! 91 facets and 10 Hearts & Arrows - The unparalleled brilliance of the Solasfera. Ranging from 0.3 - 1.5ct. Visit or email us at sales@jannpaul.com for more information.